This morning, the Supreme Court will hear oral argument in United States v. Texas, the Republican lawsuit seeking to invalidate the Obama administration’s executive actions on immigration. In an essay that appears this morning in Washington Monthly, I explain why the lower court opinions in this case provide a vivid illustration what I have described elsewhere as “judicial truthiness,” insofar as they paint a descriptive picture of the Obama administration’s initiatives bearing little meaningful resemblance to factual and legal reality. The plaintiffs now aggressively urge the Supreme Court to embrace this false picture, which appears quite clearly in U.S. Circuit Judge Jerry Smith’s inventive but legally incorrect use of the term “lawful presence” to characterize the principal effect of those initiatives. I argue that the Supreme Court should reject their arguments and put an end to the politicized truthiness that has infected this litigation from day one and undermined the appearance of justice. Instead, the Court should insist upon adherence to traditional norms of judicial fact-finding and reasoned decision-making—adjudicative norms that Chief Justice John Roberts has also emphasized as important in promoting public confidence in government in an era of deep partisan divisions. One issue warrants greater attention and scrutiny than I was able to devote in that essay. In arguing to the Supreme Court that the administration’s initiatives are unlawful primarily because they “affirmatively grant lawful presence and eligibility for work authorization, as well as a host of other benefits,” the plaintiffs now aggressively emphasize “lawful presence” as the primary supposed effect of those initiatives—treating that phrase, like Judge Smith did, as entailing a formal immigration status or unitary, coherent legal classification with some sort of overarching, unitary meaning. (Resp. Br. 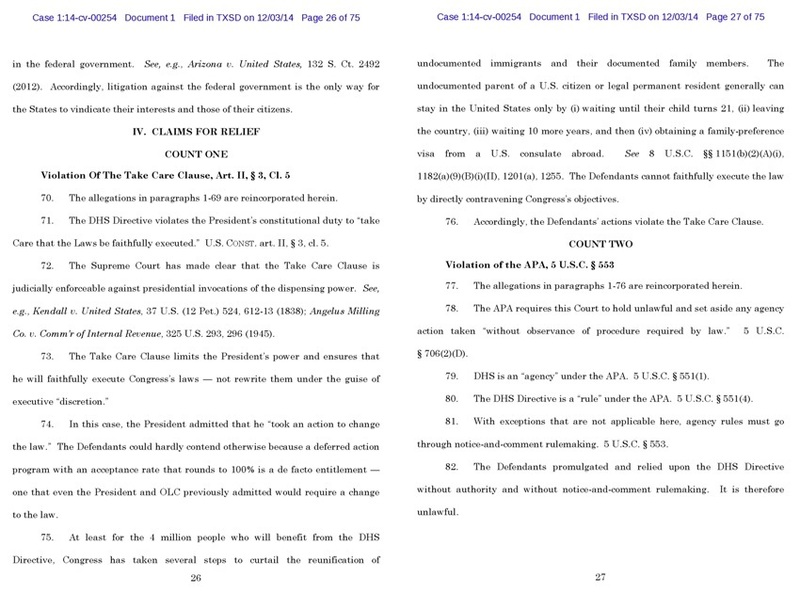 at 15) The plaintiffs insist that by allegedly granting this aggregated, intertwined package of legal rights and benefits that they call “lawful presence,” the administration is “unilaterally declaring unlawful conduct to be lawful”—and indeed, on the very same basis, might even be tempted to go further by “granting millions of aliens lawful permanent residency or even citizenship.” (Respondents’ Br. at 36). As I have previously explained—and as both the government and intervenors also effectively elaborate in their reply briefs—these arguments about “lawful presence” are ultimately a charade. (Emphasizing that he does not “say this lightly,” David Leopold, a leading immigration lawyer and former president of the American Immigration Lawyers Association, goes further to suggest that parts of the plaintiffs’ Supreme Court brief “push the envelope on an attorney’s obligation of candor toward the tribunal.”) In the reality-based community, the plaintiffs’ arguments do little to effectively call into question the legality of the administration’s guidance for the exercise of deferred action—especially since the plaintiffs now concede that they are not challenging either the manner in which administration has set enforcement priorities or its authority to exercise enforcement discretion at all. Indeed, the plaintiffs also now concede that immigration officials “ha[ve] been free all along to issue ‘low-priority’ identification cards” to every single individual eligible for deferred action under the administration’s initiatives (Resp. Br. at 39). To the extent that the plaintiffs instead mean to challenge any collateral rights and benefits that might be available to deferred action recipients, those collateral rights and benefits do not arise from the administration’s policies themselves, but from other laws and regulations—which the plaintiffs never have sought to directly challenge, and probably would have no legal avenue to directly challenge in any event. Here, I want to leave the substantive merits of these arguments to one side to some extent, and instead to highlight just how far the arguments that the plaintiffs now raise in the Supreme Court diverge from those that they originally made when they steered their lawsuit to U.S. District Judge Andrew Hanen in the Southern District of Texas in the first place. It is somewhat strange that any of us are talking about “lawful presence,” eligibility to apply for employment authorization, and some of the other issues that the plaintiffs now aggressively foreground before the Supreme Court at all—because for the very most part, the plaintiffs did not make any of those arguments in the district court. How did this lawsuit morph into what it has now become? And that’s pretty much it. Only one stray line in their preliminary injunction motion—asserting that “Congress has enacted a specific and finely tuned statutory scheme limiting the lawful presence of undocumented parents of U.S. citizens” (PI Motion at 24)—came anywhere close to suggesting that the phrase “lawful presence” was relevant to the plaintiffs’ arguments at all. And even there, the plaintiffs used that phrase in passing and without further definition or explanation—and without suggesting any different meaning of that phrase from the many places in their complaint and motion where, in alleging that President Obama was trying to “legalize the presence” of millions of undocumented immigrants, they accused him more colloquially of granting the same lawful immigration status by decree that Congress had declined to authorize by enacting either the DREAM Act or comprehensive immigration reform. In a similar manner, the plaintiffs also showed little interest in their arguments to the district court in the legal authority governing temporary employment authorization for deferred action recipients. In their complaint, the plaintiffs faulted the Obama administration for permitting deferred action recipients under DAPA to apply for employment authorization, but without referencing or considering the statutory and regulatory authority that actually governs work authorization for those individuals. Instead, they treat work authorization as flowing from and inextricably intertwined with the guidance announcing DAPA itself. (Amend. Compl. ¶¶ 47, 53, 61, 68) In their preliminary injunction motion, discussion of the legal authority governing work authorization is similarly absent. The plaintiffs discussed that authority for the first time only in their reply brief; the discussion reads as if they had not even known about the existence of that legal authority until the government pointed it out. It should hardly have been surprising, therefore, that when Judge Hanen issued his opinion and order granting the plaintiffs’ motion for a preliminary injunction in February 2015, he followed the plaintiffs’ lead by repeatedly conflating and using the terms “legal presence” and “legal status” interchangeably. In a number of especially jumbled instances, he even mashed them up into what he calls “legal presence status”—a wholly made-up concept with no legal meaning at all. Like the plaintiffs, Judge Hanen also showed absolutely no interest in the legal authority governing work authorization. To the extent that he expressed concern at the collateral legal rights and benefits that might result from deferred action, he treated those collateral consequences as inextricably intertwined with deferred action itself—thereby rendering deferred action under DAPA as supposedly being something other than the exercise of enforcement discretion. Contrast the arguments advanced by the plaintiffs in the district court with the arguments that the plaintiffs now aggressively urge upon the Supreme Court. Evidently, the plaintiffs no longer consider deferred action for individuals eligible for DAPA itself to be inconsistent with the immigration laws—even, perhaps, on a categorical basis “rubber stamped” by senior officials. Their brief concedes that Congress has delegated sweeping authority to executive branch officials to establish enforcement policies and priorities, and they emphasize that they no longer challenge the particular administrative guidance memorandum reflecting the manner in which the Obama administration has chosen to delineate those priorities. (Resp. Br. at 10.) The plaintiffs also appear to concede that the exercise of enforcement discretion in the form of deferred action itself (at least as properly understood) poses no problem, asserting (albeit falsely) that Judge Hanen’s sweeping preliminary injunction “does not affect the Executive’s enforcement discretion.” The plaintiffs go still further to concede that immigration officials are “free . . . to issue ‘low-priority’ identification cards” to every noncitizen eligible for deferred action under DACA if they wish to do so. (Resp. Br. at 39.) None of these concessions seem fully consistent with the arguments that the plaintiffs originally presented in the district court, in which they insisted that executive branch officials have a “mandatory duty” to initiate removal proceedings against all potentially deportable noncitizens and may not exercise prosecutorial discretion to forbear from initiating removal proceedings. What the plaintiffs now seek to pound into the Supreme Court justices’ heads instead is their newfound embrace of the notion that deferred action under DAPA entails a “grant of lawful presence” in the sense fashioned by Judge Smith. The plaintiffs now use that phrase not in the colloquial manner in which they used phrases along those lines in the district court—which would be quite obviously incorrect, insofar as that would equate the meaning of “lawful presence” and “lawful immigration status”—but rather in a technical manner apparently meant to refer to some sort of formal immigration classification established by Congress that is nevertheless also somehow distinct from lawful immigration status. However, as I have previously explained, no such formal immigration classification actually exists in the manner that the plaintiffs claim it does. In this context, given that the plaintiffs’ own arguments to the Supreme Court bear only limited resemblance to those they originally presented to Judge Hanen in the district court, I literally almost fell out of my chair laughing when I read the plaintiffs’ objection in their Supreme Court brief to “shifting arguments” that the government supposedly did not make below. After all, if that’s the measure, a substantial percentage of the plaintiffs’ own brief should be considered out of order, for their approach to this litigation has mostly involved “shifting arguments.” The most significant arguments that the plaintiffs now urge upon the Supreme Court are arguments that were nowhere to be found when they originally steered their lawsuit to Judge Hanen and presented their arguments to him in the district court. Which tells us something. I’ll leave it to experts on appellate procedure to consider whether or not the plaintiffs have formally waived their arguments about “lawful presence,” employment authorization, and collateral rights and benefits for recipients of deferred action because they did not adequately present those arguments to the district court in the first instance. For her part, U.S. Circuit Judge Carolyn Dineen King, dissenting from Judge Smith’s majority opinion in the Fifth Circuit, expressly concluded that the plaintiffs had indeed waived some of these arguments by not raising them in the district court. She might well be correct; I myself don’t have a strong view on the matter. More interesting and significant may be what the plaintiffs’ lurching about to make entirely new legal arguments on appeal says about this case more generally. From the moment the case was filed—in a fairly transparent but successful effort at forum shopping—United States v. Texas has been a deeply politicized lawsuit, one whose central allegations diverge dramatically from the basic factual and legal realities concerning the Obama administration’s deferred action initiatives. In many ways, the arguments that the plaintiffs now aggressively push concerning “lawful presence” represent the apotheosis of that politicized truthiness. That those arguments were nowhere to be found when the plaintiffs originally presented their claims in the district court would seem to offer further support for the now widely shared conclusion that the lawsuit against the Obama administration’s deferred action initiatives simply constitutes a political attack in search of a legal rationale. The case is United States v. Texas. The Plaintiff is the UNITED STATES, not Texas nor any of the other 25 states. Because Texas, et al, won the prior two cases it is the Obama regime who is the Plaintiff in this SCOTUS case, effectively complaining about the previous two juridically correct rulings at the district and Appeals court levels. Texas won and Obama lost, twice! William J. Green: The United States is the petitioner in the Supreme Court, which is why it is listed first. The term "plaintiff" refers to the party who initiated the lawsuit, so Prof. Kalhan is correct in his usage. There used to be a term called "plaintiff in error," which referred to what we would now call an appellant or a petitioner. However, that term is no longer used. Thanks for that clarification, Mr. Dorf. By the same token Texas, et al, are referred to as Respondents, NOT Plaintiffs. Texas et al would have been happy, having begun as Plaintiffs and won at the district and appellate levels, to have the injunction remain in effect indefinitely. It is only because the Obama regime challenged the two lower court rulings and complained to the SCOTUS that they became Petitioners, and Texas, et al, became Respondents, no longer Plaintiffs! I find it extremely difficult to follow from this what of the current opinion is the result of Judge Hanen's ?District? court opinion and what is unique to Judge Smith's ?appellate? opinion. Did Judge Hanen just unwisely misuse two terms used interchangeably by the plaintiff, or did he create some new concept that was foreign to the original complaint? SG Verrilli said that nothing of consequence turned on this particular phrase.